Can one import a mesh object and use this within a site model? 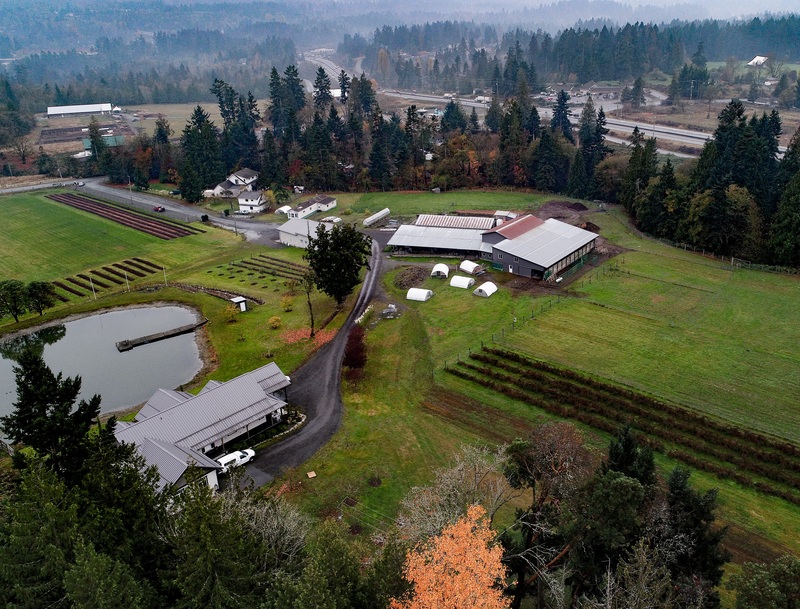 As a continuing story on the Drone import data question I contacted another firm today and was thrilled to see that they can provide me with the contours I need to construct a site model. Waiting on the level of accuracy, but hoping it will + - 1'. Interestingly I can also import a mesh object and was given a sample to look at, can anyone tell me if this mesh object is usable within a site model? I did note that the texture import failed. Also the file is 430 mg which is pretty big so I'm not keen on working with a slow, clunky file. @Art Vyou might be interested in this. Import that 439Mb point cloud or mesh file, Call it File A.
Select/Copy all the loci and Paste in Place into a blank project drawing. These points are source data for a Site Model. Not enough resolution in certain areas? Go back to File A. Make another new layer. Click click click more 3d loci - different color, Class Terrain2 (in case you need to track their source order). Paste in Place in the Site Model source data. 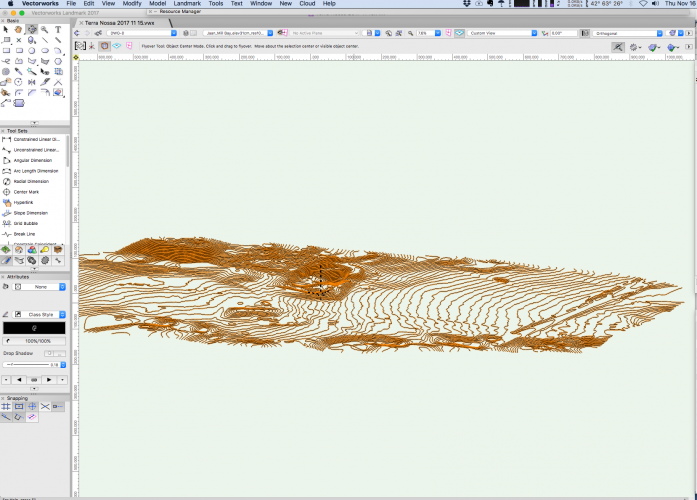 Site Model will be based on point data rather than contours. Site Model will create the contours. Would it be possible to compare this to published GIS data for the area? Previous survey monuments or data? Locate trees or building corners or roof ridges or other features with more new loci in new classes & layers in File A. Transfer to new layers in the project file & model, or place symbols/image props, add Pads, etc. This avoids most work in the giant File A. I guess FileA could reference into the project file, but not sure if that prevents lag. One down side is that the point cloud might display low vegetation same as ground, so could reduce your accuracy beyond the +/- 1'. 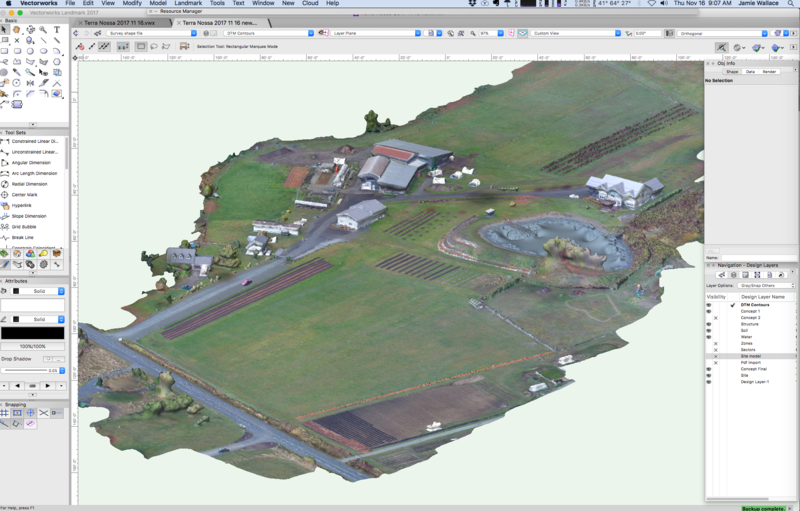 Some point clouds have color and other filters which would help. Demand a few ground beacons? Drone places and retrieves them? Probably just another stupid idea that won't work. Benson's method is imho not a stupid idea and is one way to do this and basically gives you the most control over the outcome (within the limits of the source data). The potential downside is that it may take more time to get it all done than you would like to spend on it depending on the area and how many contours you would need to get the required vertical accuracy for your site model. 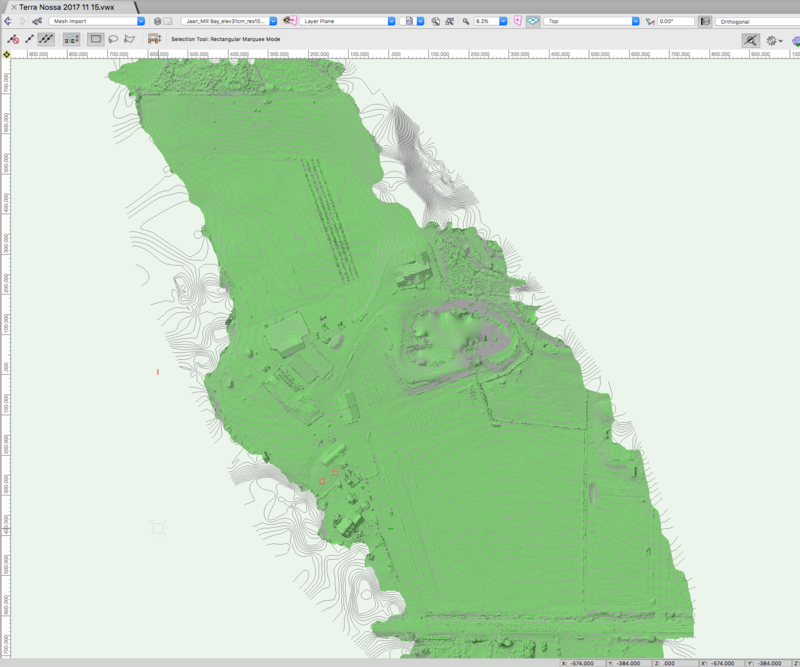 Another option is to use GIS software to import the mesh/cloud point and have that software generate the contours. Dedicated GIS software may give better results with this than VW and might be closer to the all manual results as well. For a native Mac GIS program you may want to look at Cartographica https://macgis.com/index.php though it seems to be more focused on map production than full GIS so not sure if it can generate contours. If you have a windows machine as well there are more options. Yes, the vertical accuracy is the thing to get verified. 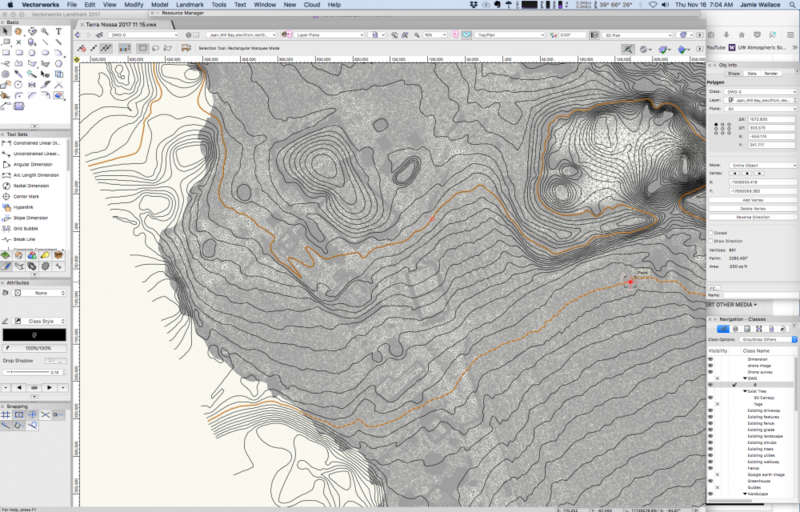 There are GIS programs that (possibly) can create contours from meshes/point clouds, see my response above. Specific for this example mesh, this is typical for a DSM (Digital Surface Model). One thing you could do is "cut off" the trees and other "obstacles" that have no relevance for your site model if all you need is a DTM for volumetric purposes. But you should make a comment/note somewhere that there are trees/obstacles that may need to be removed but that these have been excluded for modeling purposes (or something to that extent). Removing the not needed geometry may reduce your model size enough to make it usable for your purposes. Thank you @Art Vand @Benson Shawsome really good information. After some back and forth with the drone operator it looks like I can get a .1m level of accuracy with regards to elevations which I'm happy with. The operator will provide me with 1' contours which works for me, I could get this geo referenced but I'm not sure that is important. Cost isn't too bad, $1250 CAN to survey 6 acres, $200 extra for Geo-spacial or GPS points and I get some high definition images to boot. I'll keep you posted as to how this unfolds. After some back and forth with the drone operator it looks like I can get a .1m level of accuracy with regards to elevations which I'm happy with. The operator will provide me with 1' contours which works for me, I could get this geo referenced but I'm not sure that is important. Georeferencing is important if you need coordinates. If you are only creating a concept where coordinates are not needed (e.g. just a visual) then there is no need for georeferencing. Another advantage of georeferencing is that you should get things in at the right size/scale and it is easier to check against known distances (this assuming the georeferencing was done correctly). Import shape file and convert these contours to 3d polys...might consider converting to nurbs first, then 3d polys in order to reduce the vertices, as you can see in one image I have over 800 vertices on one contour line., 277 polygons in total which could give me over 200,000 vertices in my site model. 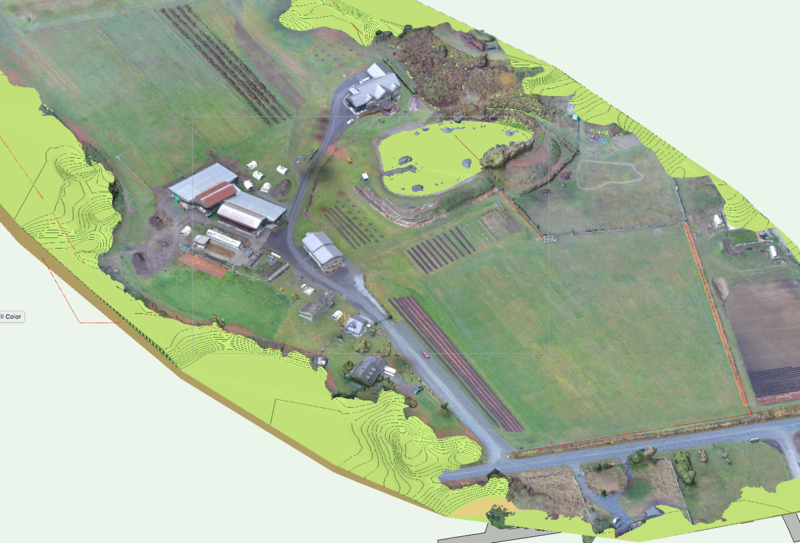 Create site model then apply some pads to the areas below farm buildings and place massing models to represent them. I'll use the mesh as a guide to applying infrastructure to the model such as roads, fences, exiting plantings. I'll probably delete the mess once this is complete as it has increased the file size by 800 mb. At this point I should have my base map or existing site model complete. I have access to a high definition .tif image but it's 595 mb in size and doesn't seem to load into VW or any other software I have. Not sure what the upper limits of image importation VW has? Thanks for your thoughts...this is the first time I've used a drone and hopefully not the last. An interesting update. 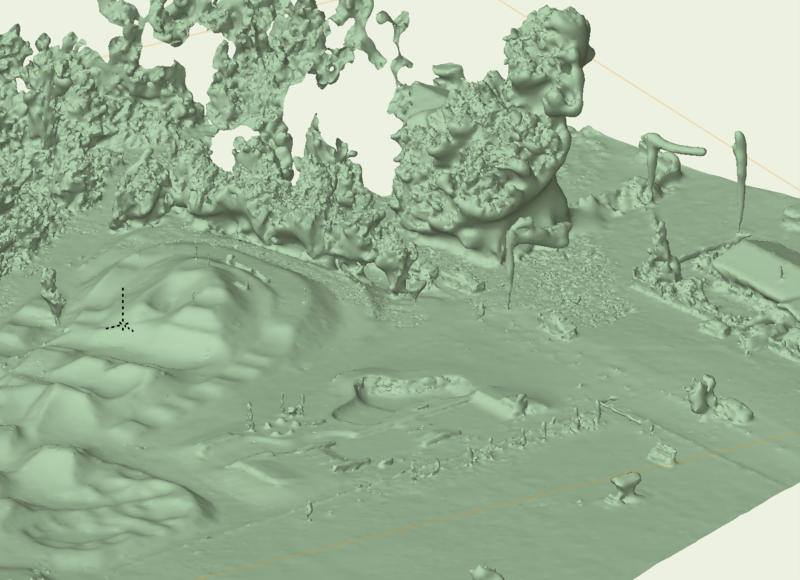 It looks like the original shape file I imported has 3d data on it even though it does not show that is the OIP. I converted these to 3d polygons and they had z information..site model is made...that was easy. Yes but apparently the operator had to make some adjustments to the contour map and mesh due to the water. Added some texture to the mesh and I'm really impress. A shame this can't be integrated to the site model. 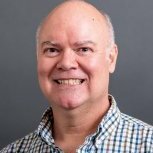 Hello J. Wallace: Interesting data! You might try running the new Modify->Simplify Mesh command on the imported mesh to see if it reduces the load without losing too much detail. Good idea Dave. This must be a 2018 feature, I'm still using 2017 until the sp2 comes out. I might try it out for fun. Thanks for showing all this and discussing the tag issues in your parallel thread. Very nice results in several formats from great investigation of the drone survey and its various data streams. 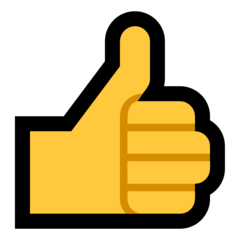 I hope you will update to forum as the project develops. Thanks @Benson ShawI was a little nervous diving into this, spending $1250 and not be entirely sure of the results. So far I'm impressed with the data I was provided and the mesh (along with textures) is pretty cool. It's a shame that the mesh can't be effectively integrated into the site model. 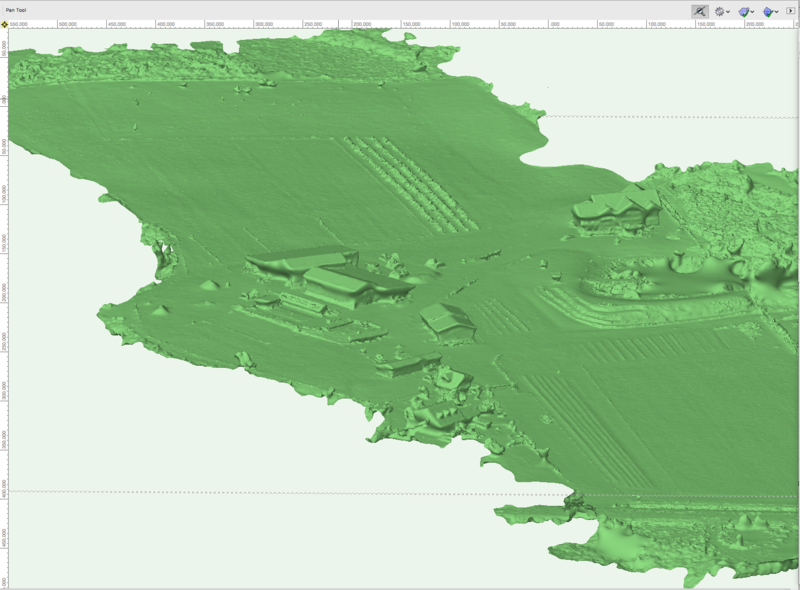 I have aligned it pretty close onto the model with the thought of tracing in all the infrastructure, roads, fencing, buildings (will be massing models). Tomorrow I should have a .tiff image I can import, the drone operator sent me a 560mb tiff image that I can't import or open in any of my software. Tomorrow I can a lower resolution version, failing that the mesh will guide me. Going to comment on this one before reading the rest. This is an issue with VW as above a certain size it will have trouble digesting large images. Though it is possible to get 16GB+ images into VW but you have to tile them into smaller images. I just checked a recent project for the size of the image tiles and they are in the 600+ MB range and do import, but these are uncompressed TIFF files. If your image is a compressed TIFF file then the actual size will be larger and it might then be a bit too large for importing properly. First resave the tiff file as a TIFF without any compression, that will give you the actual size of the image date, then you will have an idea which suggestions of the ones below might be your first one to try. 1. Tile the image in e.g. 4 parts and import those into VW. 3. If the TIFF file is georeferenced then use a GIS program to tile the image (and create tfw and prj files upon saving the tiles) so that the georeferencing is maintaned. 4. Create a jpg file, it does not affect the actual size of the image data but it might be enough to make it a bit easier for VW to digest as it internally converts images to JPG or PNG and that might sometimes be the hiccup with large files. 5. Resave the TIFF image at a lower resolution, it will reduce the file size with a factor four for each halving of the resolution (i.e. a 10 MB 600 DPI image will be a 2.5 MB 300 DPI image if all else remains the same). This will limit the amount of zooming in though, i.e. it will look pixelated faster when zooming in, so this could be an issue. If necessary combine some of the above. I don't have any GIS software, it is one of those software's I can see diving into soon. I did get some tiled images but fitting these together might be a challenge. Thanks for the great advice Art I'm hoping the lower res image will help. The file is apparently still uploading to dropbox so I'll try later. In the meantime, were there any other files with the same name but with extensions as .tfw and perhaps also .prj? If yes could you please put those on dropbox as well as it means the tif file was georeferenced. It is also possible to create a georeferenced tif file as GeoTIFF without these files, but I can only tell once I have downloaded the tif file if it is georeferenced anyway in abscence of .tfw and .prj files. Here are those other files you spoke about...The new .tiff file has a few minutes left to upload. Thanks very much for your help...this is a real education. The files were georeferenced, I've split the file into 4 tiles each with georeferencing and will send you a download link through a PM in a few minutes. The file is a GeoTIFF so most generic image editing programs may have issues opening the file as they cannot always recognize this TIFF format. Because it is georeferenced it is best to use a GIS program to tile the images if you want to have them end up at the correct place. The TFW file lists the dimensions and coordinate points for the image or tile. Splitting them in a normal image editing program does not update the TFW file and will make you lose proper referencing. Wanted to throw in my limited GIS experience. I needed GIS software for intermittent use on some community projects - no budget. I downloaded QGIS which is open source and free (I donated), vs ArcGIS and others at $hundreds US ( totally worth it if I had more than occasional use). Open and work with georeferenced street grids and other GIS files/data from GIS portals at city and county agencies. Open and work with GeoTIFFs. Create, fill, update the database for the features. Create pdf maps with labeled features for presentation and other direct use, or for import to VWX for further processing. GIS is valuable, attainable, really amazing. 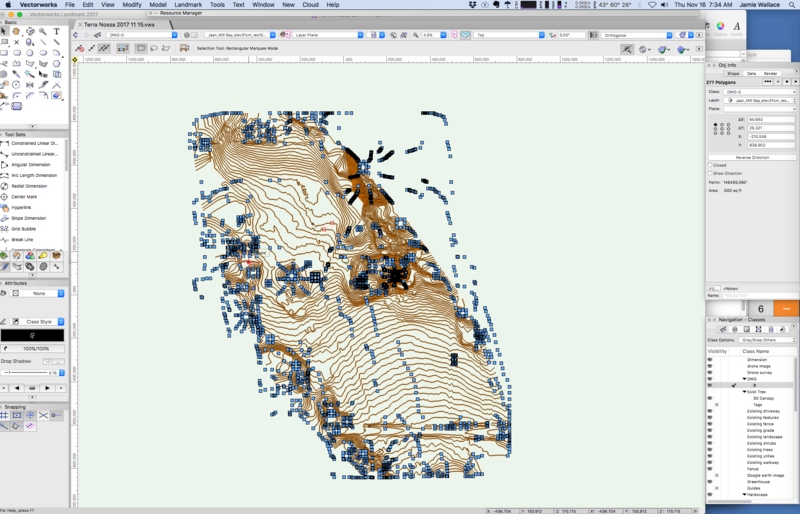 QGIS, although no cost to acquire and always improving, has significant learning curve. And then I don't use it for a year and have relearn! 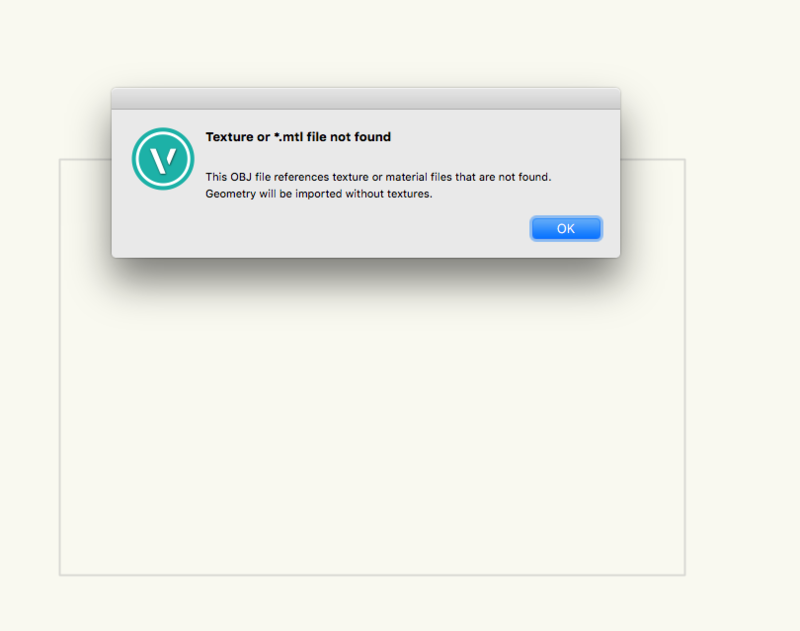 Thank you very much @Art V, your file worked really well. Imported with any issue albeit some distance from 0,0 as you mentioned. I really appreciate the effort you took Art and it is a huge improvement over the low res. image I was sent yesterday which has a pixel area of 10cmx10cm. Thanks again Art and everyone for their comments/advice. Thanks very much @Benson Shawfor your GIS insight. I think I'll download the QGIS and work on learning this. 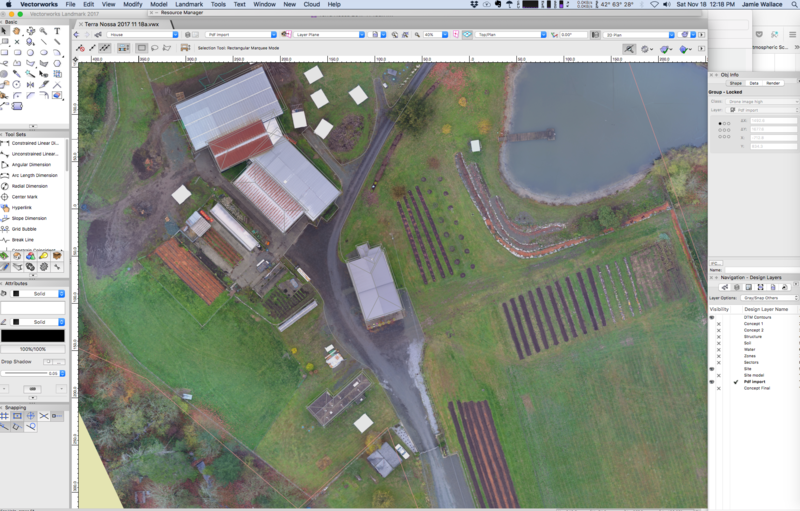 I can see drone data being invaluable for some of my future projects. I think I'll download the QGIS and work on learning this. Packtpub has more books and even a video on QGIS, but the above two books should get you a long way, just do a search for QGIS on Packtpub to find them.